Lights, camera, action! Are you ready to go live on Instagram? Or does the thought of hitting that “live” button give you heart palpitations? 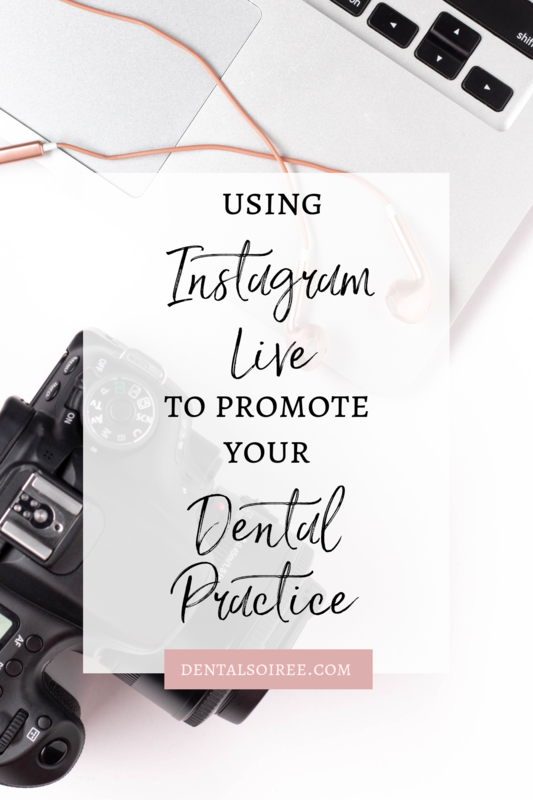 We’ve seen great success with our clients who regularly use Instagram Live, and we know that it will be an effective way to promote your dental practice, too! However, there’s a little more to it than just working up the nerve to hit the button! You have to have something interesting to talk about. Otherwise, why would anyone tune in or stick around to watch your entire stream? 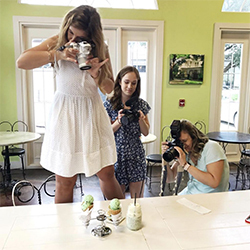 In this blog post, we’re going to give you five fun Instagram Live content ideas you can use to promote your dental practice! There are new dental products hitting the market all the time and your patients and followers want to know how YOU feel about them. After all, you’re the expert. Take one of the new products and do a live video where you outline the claims of the item and then provide your expert insight as to whether those claims are valid and whether you think it’s worth your follower’s time and/or money. As dentists, we know there are shocking stats out there that people just aren’t aware of. Knowling the sometimes scary information about dental care can help people stick to their goals, and getting expert advice from someone who really knows what they’re talking about (that’s you!) can be invaluable. Hook your followers in with a great teaser for your live video, then give them all the info they need to stay healthy when you go live! People love getting a look behind the scenes! Do an office tour for new patients who haven’t been to your practice before. Go into the breakroom and show people what you’ve stocked the fridge with. Trust me, they love to see things like this! Show them how a piece of equipment works to dispel some of the mystery around a procedure. Pull back the curtain a little bit and let them see the inner workings of your practice and give them a chance to ask questions as you go! Did you just hire a new team member? Sit down with them for a live video where you introduce them and let them talk a little bit about their life and passions outside of work! It’s a great way to get current patients comfortable with the new employee, and it’s also a fantastic opportunity to reach potential new patients with a more laid-back live video to show off your team’s personality! If there’s one thing we know for sure, it’s that people have lots of questions about what we do. Answer their questions in a live Q&A session on Instagram Live! You can allow your followers to leave their questions in the comments of a post beforehand, or you can let them drop questions right in the chat during your live stream. If you choose to do the latter, it’s always a good idea to have a few questions prepared in advance that you can answer as you’re waiting for people to participate! With all of these ideas, don’t forget to build up some anticipation first. Create a few social media posts to promote upcoming video and post them throughout the week leading up to your live stream. It’s a much more effective strategy than just going live and hoping people will show up! If you feel like you need a little more instruction before jumping in, we have a great mini-course on Instagram Live over on The Soiree Suite. It will teach you everything you need to know to use this tool to promote your dental practice, plus we share our favorite insider tips for rocking your videos and your marketing! Can you believe 2019 is already here? It seems like the years go faster and faster and things change at the speed of light… especially online marketing. It can be so difficult to know where to spend your time and money, especially if marketing is not your primary area of expertise! 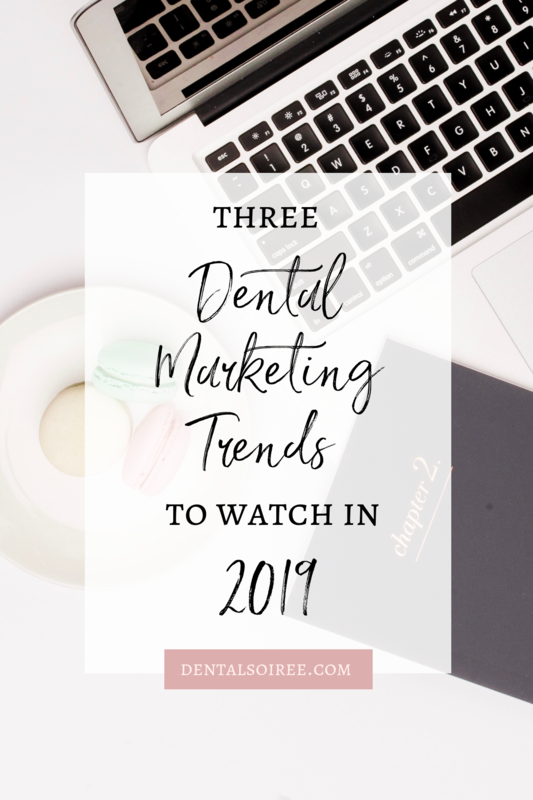 We want to share three of the dental marketing trends we’re watching for in 2019. We think focusing on these three areas will get you the most “bang for your buck” when it comes to your dental practice marketing! You might think we’re crazy to start with email marketing. After all, isn’t email the oldest digital marketing channel there is? Yeah, maybe, but it’s also one of the most effective. As we rely more and more on social media, it can be easy to forget that those followers are simply “borrowed” contacts. They belong to the platform, and if the platform goes (or changes their algorithm again) you might not be able to reach them. With email, your contacts are always your contacts, and when you send something, they get it. Simple as that. In 2019, we’ll be focusing more on email marketing, and we think you should, too! It doesn’t take a lot of time to create a great email template that you can use over and over again (and tweak if you need to) and you can always test new subject lines and strategies. Don’t be afraid to send more email in 2019! One thing that we fully expect to be even more popular in 2019 is Instagram Stories! It’s such an easy way to connect with your followers, and they love the chance to get to know the “real” you through these short, easy-to-digest videos. Photos are also popular in Stories, but we have a feeling videos will rise to the top and you’ll see even more of them over the next year! If you’ve been hesitant to share videos (especially of yourself) on Instagram Stories, make this the year you overcome your fear or reluctance and just hit that video button! Your followers will love the chance to see the more human side of your practice. Lastly, we’re keeping an eye on chatbots. These started to get popular in 2018, but we think in 2019, even the smallest small businesses (and practices) will start to use them as well. Chatbots are sometimes programmed onto a business’ website and now they’re even being used on social media platforms like inside Facebook’s messenger feature. Chatbots can help you get your website or social media visitors the information they’re looking for 24/7 so they don’t give up and possibly head over to a competitor. You don’t have to be an expert to create this either. There are lots of easy-to-use programs online! What do you think will be the biggest dental marketing trend of 2019? Do you think it will be one of the three we listed above… or something totally different? Head on over to our Instagram page and let us know what you think! Online marketing is constantly evolving, and something that worked perfectly last year might not work for you this year. It can be so frustrating, but it’s part of the job and reading up on the latest news and advice is key! 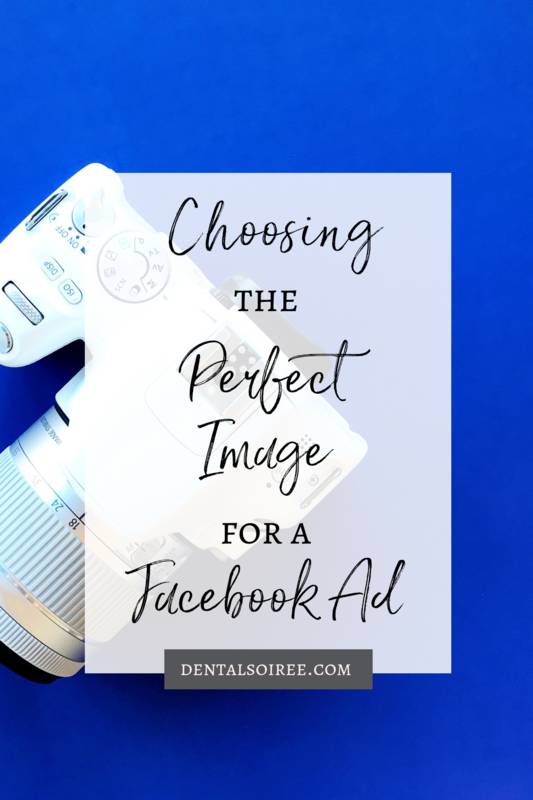 When it comes to choosing an image for a Facebook ad, this is especially important, because the rules seem to change even faster! 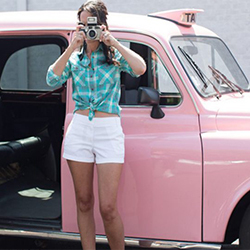 Did you know the image is actually the most important part of your Facebook ad? Images are responsible for 75%-90% of your ad’s performance, according to Consumer Acquisition. Don’t let that overwhelm you, though. A few basic “best practices” can have you feeling confident instead of paralyzed the next time you advertise on Facebook. Facebook recommends that your image be at least 1200 pixels wide but no smaller than 600. Going any smaller than this will result in a pixelated or grainy image which does not reflect well on your brand. They prefer landscape rather than portrait when it comes to orientation. You’re spending money on your ad, so you want to make sure people actually notice it, right? Choosing the perfect image for a Facebook ad means considering the environment it’s going to live in. If you choose an image that is too similar to Facebook’s colors (mostly white with some blue), it could get totally lost. Consider using images that have bright colors that compliment your brand– think bright pink, orange, red, or turquoise. While Facebook doesn’t allow ads with a lot of text on the image, you can add a few key words to help entice your audience. When planning your ad design, make sure there’s a logical place to add text that isn’t going to cover up a vital part of your image, then use Facebook’s Text Overlay Tool to make sure you don’t have too much text on your image. When you set up your Facebook Ad, you’ll get to choose from a number of different ad options. Consider going with a carousel ad (the kind with multiple images that is displayed like a slideshow). According to some experts, these ads perform better, and they also give you a chance to feature multiple images. Choose contrasting colors, or play with the sequence element of the ad to get people to stop and take notice! If you need stylish images for your Facebook ads, we’ve can help! Our sister site, Soiree Stock, offers some very affordable membership options that include unlimited downloads from multiple photo libraries! We even have photos that are specifically geared toward dental professionals! You’ll find exactly what you need, and you won’t have to rely on those boring, cheesy stock photos that are out there… you know the ones we mean! If you’re anything like the team here at Dental Soiree, you spend a good amount of time on your phone! There’s no way around it. These things run our lives… everything from our calendar to our banking account to our travel itinerary is on our smartphones. Being connected is important not just for staying in touch and on top of our busy lives. It’s also a great tool to help you grow your dental practice. If you leverage the tech that’s already at your fingertips, you can spend less time trying to accomplish #allthethings and more time doing the few things that really are going to make a difference. At the beginning of 2018, there were 3.8 million apps in the Google Play store and 2 million apps in Apple’s app store. Rather than be overwhelmed by all these options, we encourage you to download the three apps we outline below for the ultimate productivity boost. If you can only download one app, you should definitely choose Evernote! If you’re like me, your mind is running a mile a minute and ideas are always flowing. Evernote is the best way to capture your lightning when it strikes. This app keeps all your thoughts in an organized, easily searchable platform. The best features of Evernote come in the labeling and categorizing aspects. You can easily keep your blog ideas separate from your dinner party planning notes or your ongoing list of hot new places for drinks. Get started with Evernote for free and upgrade to Pro or Premium based on your needs. 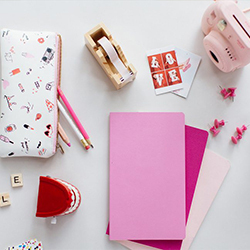 Now that you’ve captured all your ideas with Evernote, it’s time to make them POP! Of course, we’re passionate about attention-grabbing images, and Canva makes it easy to create your own with simple drag-and-drop functionality. You can use your Canva graphics on social media, and even in your freebies, eBooks, or emails. It can be overwhelming at first, but start small and you’ll get the hang of it quickly. Smart, stylish templates take the guesswork out of creating the perfect post, and with the numerous fonts available, you can choose the perfect look for your brand. You may be using Canva to increase your efficiency, but the true upside is not sacrificing style. All the handy options they provide allows you to remain consistent in content and message. I call that a huge win! Being consistently present on social media and in your potential patient’s feeds is vitally important. It can be time consuming, though. Buffer is a great option to manage all your social media accounts from one site. See who is locked on your thread, determine what type of posts get your target audience excited, and watch your followers grow. When you want to show up online as an ever-present social media guru, Buffer is the app you need. You can schedule content so you’re showing up even when you’re spending time with your family or at the gym. Does your most recent blog post need some attention? Post it to all your accounts at once in Buffer! At the end of the day, working to grow your dental practice and make sure it’s successful should be your number one goal. 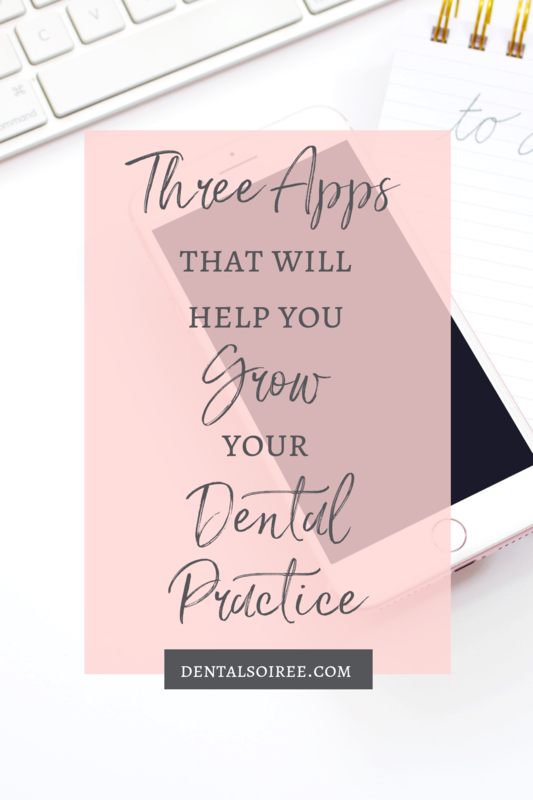 These apps help streamline and improve your efficiency so you can grow your dental practice without sacrificing your sanity. 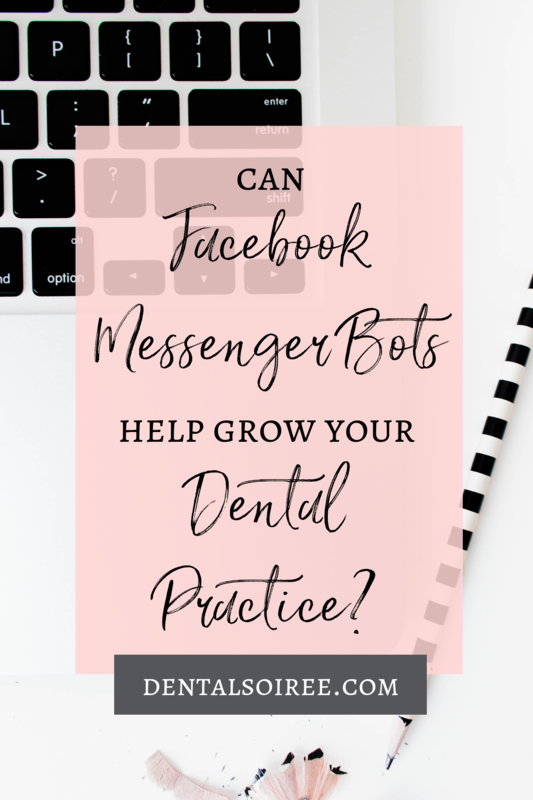 Can Facebook Messenger Bots Help Grow Your Dental Practice? Chances are, you’ve run into a bot while using Facebook Messenger already. So many businesses are using bots to interact with both potential and current customers on Facebook and it makes sense. 80% of adults and 91% of teens using messaging apps every day, so it was only a matter of time before the traffic became too large to manage without some kind of automation. You might think you have to be one of those “techy” people to be able to successfully use a bot, but there are actually a lot of companies out there that create user-friendly tools and programs so people like you and me can easily get a bot set up and running. Sometimes, bots are used to reach out to a targeted demographic to announce a sale or special offer. Sometimes, the bot acts more as like an assistant, helping people that have reached out via Messenger with a question or request. For example, I’ve seen a hair salon use a Messenger bot to guide a potential customer through the process of booking an appointment. When I saw this, it clicked that this is definitely a great way for a dental practice to utilize this technology, too. Available dates and times are displayed for the customer (or patient), and once a time slot is selected, it would be removed from availability. The bot can even send an appointment reminder via Messenger. Pretty cool, right? One of the more popular bots out there, ManyChat, boasts an 80% open rate when it comes to their Facebook Messenger marketing service. If you want to promote a special offer or new service, this is definitely something to consider. It does take a little more effort to set something like this up, though. You would need to have a list of people that are interested in hearing about your services, kind of like an email list. You would them put them into this bot “funnel” while of course giving them the option to opt out at any time. Unlike email, you don’t have to worry about your messages getting lost in a promotions or spam folder, and you don’t have to agonize over the perfect subject line. Just craft the message and let the bot handle everything else! Will Bots Help Grow Your Dental Practice? There are over 1.3 billion Facebook Messenger users (as of December 2017) and 30,000 bots already handling all kinds of tasks for businesses. There’s no reason why this tech can’t help you grow your dental practice, especially if you feel like you’re losing perspective patients because you’re too busy to respond to everyone’s inquiries. Some have free trials of low monthly rates, so there’s little to no risk involved with trying it out. You never know, it could end up becoming a super effective part of your social media strategy! 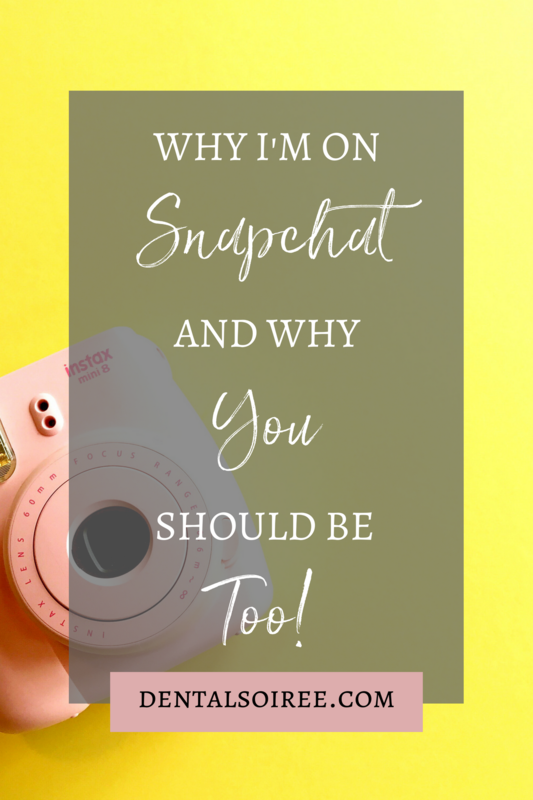 Why I’m on Snapchat and Why You Should Be Too! People are often so surprised to find out that Snapchat is my favorite platform for my business. Most people just don’t think of it as a business app, but it totally is! 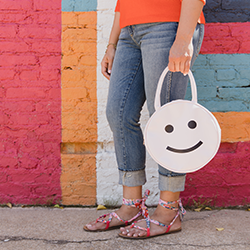 Not only is it a great way to give people a glimpse into your day, it’s super fun, engaging, and it disrupts the norm… which is my mission as a digital marketer. If you’re not using Snapchat for business, I’m here to convince you to start today! It’s so funny, when I posted about Snapchat recently on my Instagram page, someone commented that they’re not “allowed on Snapchat” according to their teenager. Ha! Well, let me be the first to tell you that Snapchat is not just for teenagers. They might be mortified for a moment when you set up an account but they’ll get over it. So many businesses and brands are using Snapchat these days. Not only can you advertise on the app just as well as you can on any other social media platform, you can really build relationships with people. It feels more one-on-one than Instagram or Facebook does. Even though your snap goes out to everyone you’re connected with, when someone watches it, they really feel like it’s just between you and them. Whenever you open up a new line of communication between yourself and your patients, it helps them feel more connected to the practice. If they have a question or a dental situation arises and they’re in need of an expert opinion, they can reach out to you on social media. Trust me, this is not bothersome. Instead, it is a great way to grow your reputation and show patients you care. Get Ready to Master Snapchat! We’re going to be doing a Snapchat challenge pretty soon, similar to the Instagram challenge we just wrapped up for dentists last month. If you want to dive headfirst into the world of Snapchat, this is a perfect opportunity! Head to this page for more details on the challenge, and stay tuned for updates on our upcoming “Snapchat for Dentists” course that we’re launching! If you missed out on The Instagram Suite course, it’s still available for download. In this straightforward video course, we teach you everything you need to know about Instagram for business. You can check it out here!